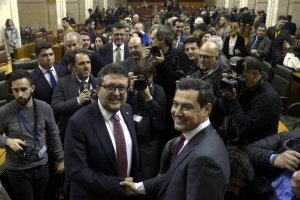 With far-right backing, the candidate of Spain’s mainstream conservative People’s Party (PP) has been invested as the head of the regional government in Andalusia, a former Socialist (PSOE) fiefdom. The Socialists had ruled Andalusia in the country’s deep south for 36 years before last month’s regional elections tipped the balance rightwards. The PP’s Juan Manuel Moreno was elected to run the regional executive with 59 of 109 assembly votes, the 12 of far-right newcomers Vox giving him a majority. He also has the support of centre right group Ciudadanos (Cs). Vox lent its support after becoming the first far-right grouping to enter a regional assembly in four decades, since the restoration of democracy following the 1975 death of dictator General Franco. The group, which scored 11 percent in the December poll to stun the establishment, will not form part of Moreno’s administration in Spain’s most populous region. Francisco Serrano, Vox leader in Andalusia, said his party ‘has come to give a response to many Spaniards and Andalusians who are fed up and do not feel represented by any political party’. Serrano added: ‘Vox has been the democratic tool which has put an end to the Socialist regime’ in the region. Spain’s Socialist Prime Minister Pedro Sánchez, whose party will now serve in opposition for the first time in the Seville-based regional assembly, slammed Vox’s arrival on the scene. ‘In Andalusia, the existing red line in Europe not to ally with the extreme right has been crossed,’ he said from Strasbourg, where he was attending the European Parliament. Before Vox’s rise, the fight against gender violence enjoyed wide cross-party support in Spain and thousands demonstrated in major cities on Tuesday for an end to machismo violence and for gender equality.